Today is Groundhog Day. For those that missed the riveting footage from Punxsutawney this morning, you can catch it again here. I, for one, am glad that Phil predicted an early spring, and I’m sure most of the country (meaning everyone to the west and north of North Carolina) hopes he’s correct. I feel like Phil may be onto something considering I spent a good portion of today outside in 60-degree and sunny weather. It’ll be back in the 30s tomorrow, but at least it was a brief respite from winter. 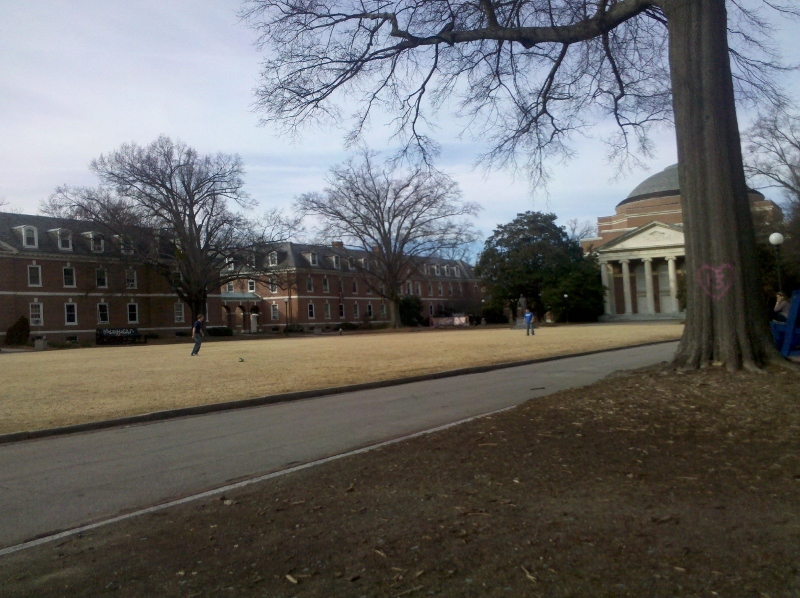 East Campus — the busiest I’ve ever seen the quad with 2 frisbee players on it. I’m not kidding — Duke kids don’t seem to play outside. Groundhog Day is a great “holiday” that always makes me think of the old Bill Murray film by the same name. If you haven’t seen it, here’s the basic storyline: Bill Murray plays a weatherman that always gets stuck covering the annual Groundhog Day celebration each year. One year he becomes extra agitated by it, and for some reason, he wakes up the next day only to find that it’s Groundhog Day all over again. Does he ever escape re-living the same day, seeing the same events and people over and over again? You need to see the movie. As I thought about the film today, I started to wonder if there were certain things that I wouldn’t mind doing or enjoying over and over again everyday. If you can’t tell already by this blog, I clearly enjoy food and wine, so those two were at the top of my list. I think I would be pretty okay with having the chance to try out a new recipe or type of wine everyday for the rest of my life. As my thoughts progressed on these ideas I realized that I wouldn’t just want to try out new wines and foods, but also share them with other people to enjoy. These thoughts seemed like a basis for some pretty good new goals. I then thought of something I can start to do on a weekly basis on the blog: share a Wine of the Week! Hopefully you’re as excited about this as I am (although I realize you may not be, hah!). I really really love wine. I love discovering what I enjoy about different types of wine. I remember a few years ago, one of my grandfathers (Grandad Clearwater) said to me, “Well, I always say that you shouldn’t stop trying wine until you find one that you really don’t like. So far, I haven’t stopped.” It made me laugh, and I realized that I felt the same way. Hopefully by highlighting a wine of the week, I will be able to learn more about different varietals (I don’t think I’ll ever reach sommelier status, but it would be beneficial to know more) and also find some delicious and rather inexpensive bottles to share. To kick it off, I thought I would share a delicious brand of wine that I enjoyed this past Sunday at the Mad Men party I went to. 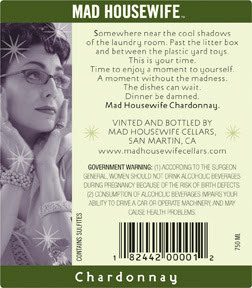 The party was at a local wine bar and Mad Housewife Cellars was one of the vendors for the event. The overwhelming response from all party-goers was that the wines were fantastic! I tried both the Cabernet Sauvignon and Chardonnay varietals and was pleasantly surprised by each. The Cabernet was not too heavy and had a strong flavor of cherry and coffee that was really refreshing. As for the Chardonnay — I was really surprised that I liked it! I’m not a big Chardonnay drinker because they usually have a strong oak flavor, but it was very light in this variety. Very fruity, and very good. 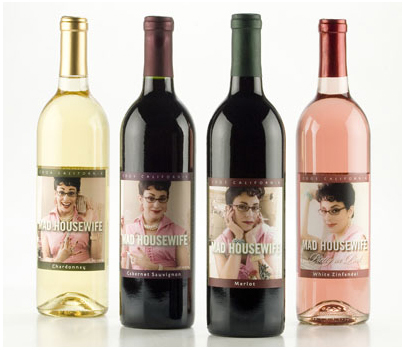 According to the website, the wines are available in lots of different grocery stores and wine stores including Publix, Kroger, and Total Wine……so go pick some up. How can you not with a name and labels like this? Do you know what tomorrow is? Hint….it’s the start of a new cycle and involves an animal other than a groundhog. I’ll be back with a special recipe!